When I first started furnishing my home office, I originally thought about buying a conference table. Pre-office space, I loved working on the dining room table because it meant having plenty of space to spread out with whatever project I was working on. If you’ve ever snuck into the conference room to use the table in there (I did a lot of that at my first magazine job), or taken a project to the dining room, you’d probably enjoy a home office table as well. These are my five favorite tables for the home office. 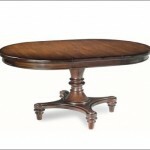 The gorgeous Pottery Barn Montego Pedestal Table extends to 65″ long with the included leaf. That’s plenty of space for meeting with clients, or really spreading out a project. It only comes in the one finish, which is a shame as I think it’d look especially lovely in a darker color, but look at that fantastic hand-turned base! Of course, the trouble with a table with a leaf is that you have to find a place to *store* the leaf, but I think this one’s worth the extra hassle. 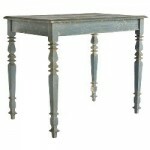 This Wisteria Spindle Leg Table in blue has a delicate, fairy tale look. It’s perfect for smaller spaces as it’s just 22 inches deep. Because it’s hand-finished, each piece feels more one-of-a-kind than some mass produced furniture and that gives this table the air of high quality wood office furniture. 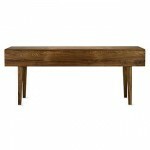 The legs are also quite elegant and would be right at home in an office with less modern furniture. Looking for something more modern than the first two? How about the CB2 Silverado? 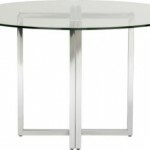 With it’s sleek silver “sawhorse” base and clear glass top, this one will be right at home in a modern home office. Round tables look lovely with hanging pendant lights, and I think the designer-recommended Firefly Pendant Lamp might be just the ticket to keep the sophisticated industrial look going. The stylish drop-leaf Harvest Table from DWR would look smashing in a home office–it’s got simple lines, and a space-saving shape which means you could push it up against a wall when you don’t need all that sprawling room, and pull it out when you did. I love drop leaf styles because then you don’t have to find a safe place for the table leaves. 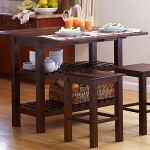 The counter-height Umbria table from World Market has space-saving storage underneath with the two shelves. Its compact square size (44″ x 44″) means you could tuck it neatly into a corner, and it would make a fantastic mailing station. Whenever I have to do a mailing, I always high tail it to the kitchen island (after cleaning it carefully, of course) because its so much more comfortable to do that sort of work standing up, with a counter-height surface. If you find yourself doing projects standing up and slouching over a table or desk, this table would be a perfect upgrade to your home office if you have the space. What do you think? Would a table have a place in your home office? Or do you work in a room (like the dining room) that has one already? Ever since I got my Vaio desktop (a gorgeous computer that I love working on–seriously), I’ve been enamored with the wireless keyboard. It’s easy to use and really responsive. Since I’m a fast typist (100+wpm), it’s important to me that the keyboard not hold me back. It’s also important that it not look beat up too quickly–which, since I do a lot of typing… That definitely happens (I’ve rubbed off half the letters on my Mac Laptop’s keyboard…). The Vaio comes with a really excellent keyboard–it has just the right amount of spring, and has enough extra keys to let me control the computer from a distance (but doesn’t have so many extraneous keys to distract from the keys you really need). I’ve had it for well over a year and its still going strong. It does take (4) batteries which is a little annoying, but I use rechargeable ones so that at least I’m not tossing them regularly, and I’ve found they last quite long–probably at least 3 months with near-constant use. So, tell us about the keyboard you use right now–is it awesome? Annoying? Are any of the keys broken? Sticky? Keyboards are an oft-overlooked office tool that make a big difference in both typing speed and efficiency (when I’m using a sticky keyboard, typos become way too common). And I’d love to hear about your favorite! Last week, when I wrote about making a home office cozy one of the great pieces I highlighted was a laser cut wool rug. And it got me thinking–there’s a definite shortage of great rugs on the market. Most are a little… stuffy. Intriguingly, many shops offer great selections in an unexpected place: the kids department. I know, your office needs to be professional… But I think you’ll agree that these cheery choices can keep a room grounded without being stuffy. Here are some of my favorite rugs, whether your home office decor is traditional or sleek, or (of course) unabashedly girly. 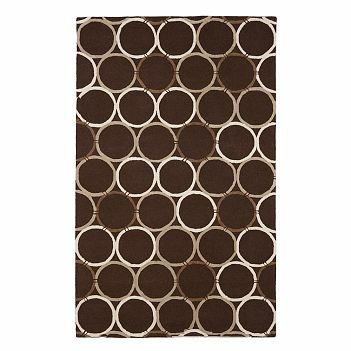 The Retro Ring Rug in brown is even on sale. With its graphic appeal and lovely texture, this rug from Pottery Barn is a great choice for a more earthy home office. 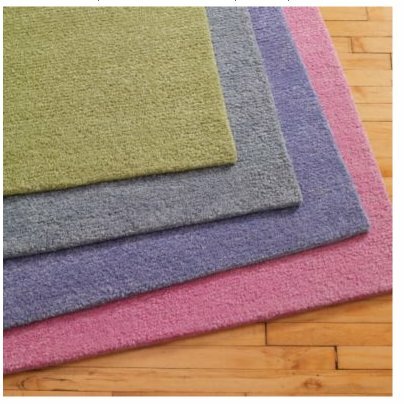 The Soft Spot rug from The Land of Nod comes in gorgeous, fresh colors you don’t often find in rugs. Sure, the pink is a surefire way to reveal your girly side, but don’t let that stop you from making such a bold statement. If you’d rather stick with something more neutral, the pastel blue is gorgeous, as is the green (plus it comes in really neutral, but un-stuffy brown and beige). 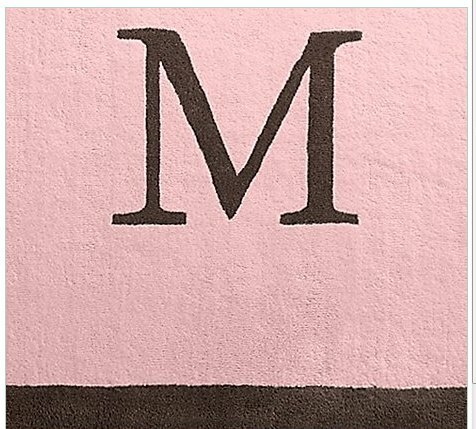 The Initial Rug from Restoration Hardware’s Baby & Child is a classic in pink or blue. The contrast of the chocolate brown makes a sleek style statement, making the rug equally at home in a traditional or more modern office space. This week, I invite you to consider those kids accessories for more than just kids rooms–you might just find that’s where you find just the right accessory to revitalize a space just like these rugs would invigorate a home office.